While Instagram has no Web-based interface to speak of, there is certainly no shortage of third party sites trying to fill that void. 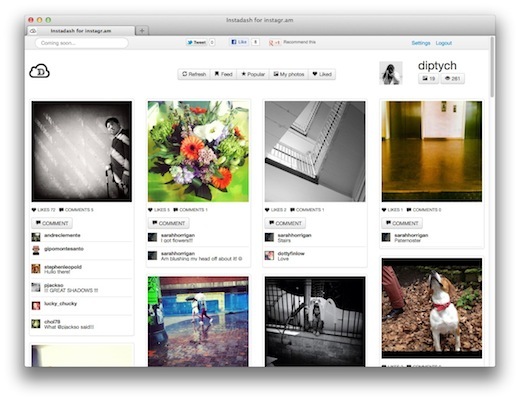 Instadash is yet another site we can add to the list of ways to access Instagram from a desktop browser. The question is, how does it compare to its competition? To decide how Instadash sizes up, we’ll be comparing it to two of our favourite sites for accessing Instagram from our computers – Ink361 and Pinstagram. 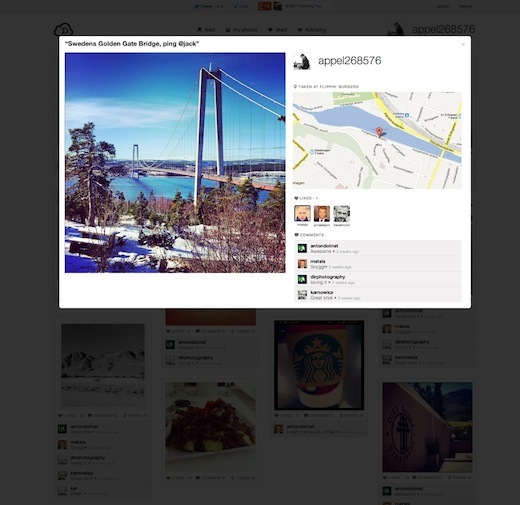 Instadash, which was created in 12 hours as part of Stockholm’s Startup Hack on May 12th, by Arno Smit and Magnus Johansson, gives you instant access to your Instagram feed. You can also keep up with the most popular photos, check out your own profile and photos you’ve added to your favourites. 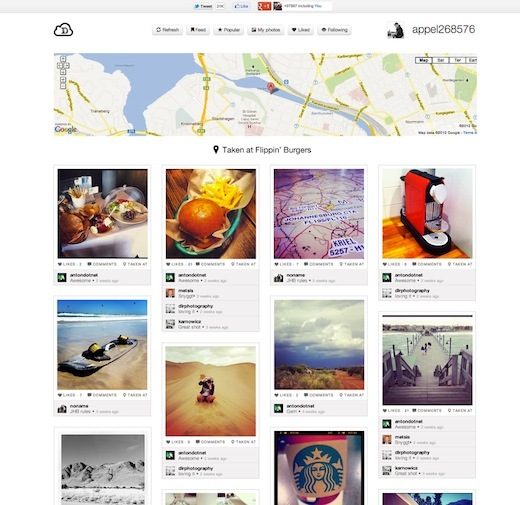 Instadash’s layout is similar to Pinstagram (and by extension Pinterest), without the ability to actually pin photos. The site’s clean grid layout puts the focus where it should be – on the photos, whereas Pinstagram’s layout can sometimes be seen as something of a distraction. Opening up any given image gives you the option to like it, leave a comment, or follow the user. You can also see other likes and comments each image has received. Unfortunately, what you can’t see is the entire image – although we’re told this is a temporary glitch and will be resolved by tomorrow at the latest. At the moment, you have to scroll down to take it all in. This is also particularly problematic when it comes to photos accompanied by long descriptions, and renders the site unusable on the iPad, which is definitely a selling point for any third-party Instagram site. Pinstagram isn’t fully usable on the iPad, whereas on Ink361, you can interact fully with the site, while full iPad support for Instadash is coming. A great feature, which we’ve seen on other Instagram-related sites, but never done this well, is the ability to view all photos taken in one location. 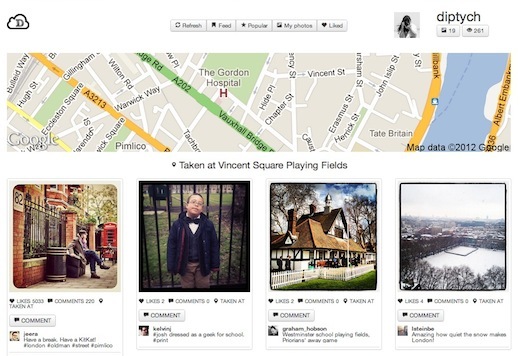 Clicking on the ‘location’ of any given photo, will open up a grid of all the other photos taken in the same area – and it looks pretty good. Speaking to The Next Web, Smit told us that the map itself will be seeing some improvements as well. More changes coming to the site include pagination or infinite scrolling, so you can view more than just the 30 most recent photos, as well as adding a search function. Instadash’s clean layout definitely wins it points in our books, and the fact that the site was thrown together in 12 hours is an impressive feat. Once the issues listed above are fixed, the site could very well steal a little bit of its competition’s thunder. 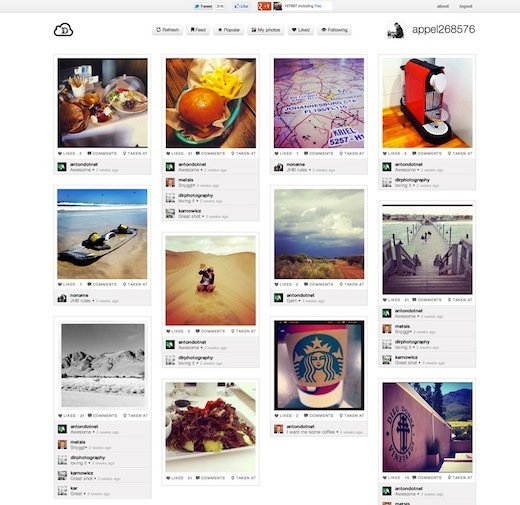 Instadash is a sleek site, and one we’ll be keeping our Instagram-obsessed eyes on.